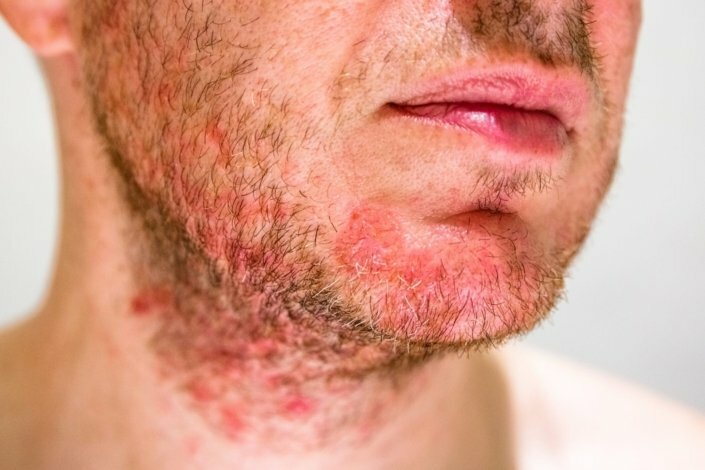 Seborrheic dermatitis is a common skin condition. It affects the scalp, face or inside the ear. The affected areas have white to yellowish flakes. The skin also can be red and greasy. When adults get it on their scalp, it’s commonly called “dandruff.” In babies, it is known as “cradle cap.” Seborrheic dermatitis can appear on other parts of the body. This includes the chest, creases of the arms, legs and groin. Seborrheic dermatitis is common in babies younger than three months of age and in adults. In adults. It’s more likely to affect adult men than women. Doctors don’t know the exact cause of seborrheic dermatitis. The cause may be different in babies and adults. It may run in families. One cause may be hormones. It usually appears in babies and disappears before puberty. Another cause may be a fungus. The fungus is called malassezia. It is present on the skin in small numbers. Sometimes the numbers increase and lead to skin problems. Your doctor will ask you about your symptoms and do a physical exam of your skin and scalp. If your doctor is uncertain about whether you have the condition, he or she may have you get a skin biopsy. This involved in cutting or scraping off a small sample of the affected skin. This step is rare. Can seborrheic dermatitis be prevented or avoided? If the condition is genetic, it cannot be prevented. Most other causes cannot be prevented. However, you can reduce the severity of symptoms. Controlling risk factors and careful skin care can help. This includes avoiding lotions that contain alcohol, using special skin products recommended by your doctor, protecting yourself from HIV/AIDs, losing weight and getting plenty of rest. Treatment depends on your age and location of the symptoms. Several over-the-counter and medicated shampoos can relieve the flaking and dryness. You do not need a prescription for these products. Look for a product that says it treats seborrheic dermatitis. Important ingredients include salicylic acid, coal tar, zinc, resorcin, ketoconazole and selenium sulfide. Adult and adolescent scalp (dandruff): Effective shampoos that contain salicylic acid and zinc include the brand names: Scalpicin, X-Seb, Exsel, Selsun Blue, DHS Zinc and Head & Shoulders. These shampoos can be used twice a week. Shampoos that contain coal tar include DHS Tar, Neutrogena T/Gel and Polytar. These may be used 3 times a week. If you have dandruff, start by using one of these shampoos daily until your dandruff is controlled. The use it two or three times a week. Rub the shampoo into your hair thoroughly and let it stay on your hair and scalp for at least 5 minutes. Then rinse. If the shampoo alone doesn’t help, your doctor might want you to use a prescription steroid lotion once or twice daily. Adult and adolescent skin creases:Steroid lotions may be used in adolescents and adults. Infant scalp (cradle cap): Baby products are not as strong as those used for adults. Start with a mild, nonmedicated baby shampoo. Use mineral oil, olive oil or petrolatum jelly to loosen the flakes. Brush your baby’s scalp with a soft brush, like a toothbrush to loosen flakes. But be gentle when massaging or brushing your baby’s scalp. A break in the skin could lead to an infection. If a nonmedicated shampoo doesn’t work, talk to your doctor about switching to a shampoo that contains tar. Your doctor may recommend a prescription shampoo such as Nizoral. Infant skin creases: Mild steroid lotions or creams may be used to treat seborrheic dermatitis in the skin creases of babies. Talk to your family doctor about the correct steroid strength. Other treatments that could help include phototherapy. This is a medical procedure in which your skin is carefully exposed to ultraviolet light. Moderate sunlight is helpful. Seborrheic dermatitis is considered chronic. Also, it is a life-long condition. It comes and goes, and it can be controlled with treatment. The negative effects of living with the condition are additional fungal infections and emotional distress. Most people who live with seborrheic dermatitis feel embarrassed and have low self-esteem. Will adult products harm a baby with the condition? Can wearing a hat help? Is seborrheic dermatitis a sign of another disease? Is hair loss a common symptom?